Staff at the H.W. 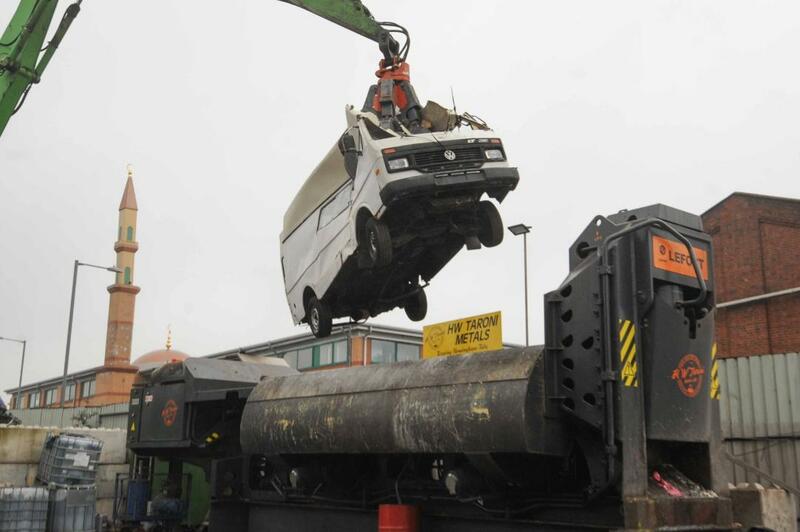 Taroni scrapyard in Aston, Birmingham had the pleasure in October 2017 of crushing no less than three vans that had been seized from illegal fly-tippers. Two of the vehicles were transit vans, the property of Andrew Smithson of Cranleigh Place, Perry Barr. He ran a company called A and R Removals which advertised for business on the internet. Earlier in 2017, Smithson had pleaded guilty at Birmingham Crown Court to nine charges of fly-tipping contrary to the Environmental Protection Act 1990, plus charges of fraud, forgery and breaches of the Scrap Metal Dealers Act 2013. He was sentenced to 30 months in jail and handed a 51-month driving ban. His associate, Joel Ducille of Turnberry Road, Great Barr, faced four fly-tipping charges and he was sentenced to 10 months in prison suspended for 18 months, 100 hours of unpaid community work and a rehabilitation order. The two men had dumped sofas, building waste and household goods all around the Birmingham area. Some of their fly-tipping was caught on CCTV. The third vehicle to be crushed was a Volkswagen camper van that had belonged Nadim Ali of Warwick Road, Sparkhill. Ali was sentenced eight months in jail for dumping rubbish that people had paid him to dump responsibly.